This is one of the very important topics that is frequently asked in competitive exams. 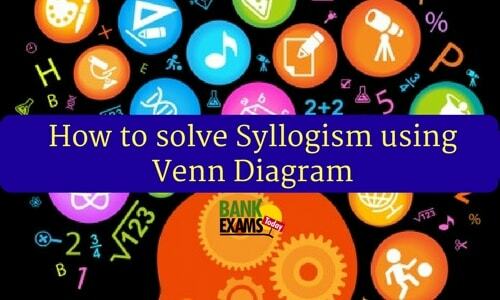 To understand, analyze & to solve questions on this topic abstract thinking is necessary. When the ordinary methods of reasoning fail, we can use symbolic logic for drawing conclusions. In this topic, each of the given statements has to be taken as true, though they deviate from the reality. 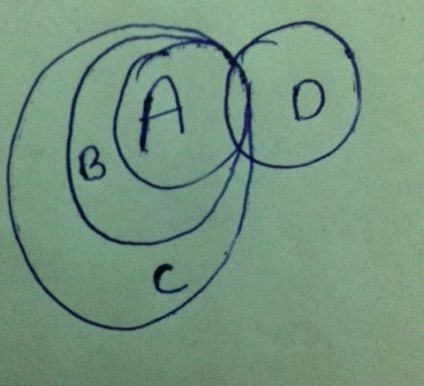 Venn diagram method is the best way to solve the questions based on this topic. A qualifier describes the extent (quantity) to which one kind (or term) is similar (or dissimilar) to another kind (or term). The main qualifiers are “ALL”, “NO”, “SOME” & “SOME-NOT”. Words like ‘few, most, many, more’ etc. are treated as synonyms to ‘some’. Words like “not all’’ & “all not” are equivalent to “some not”. Affirmative statements – The statements which contain the qualifiers “ALL” & “SOME”. Negative Statements- the statements which contain the qualifiers “NO” & SOME-NOT”. Basic Diagram represents the least possible situation for a given statement. To get least possible representation, the diagram should contain minimum overlapping. Any diagram, other than BD for the given statements, is an AD.For a statement, several ADs are possible. 1) If an affirmative conclusion is true for BD, then it will be true for all ADs. 2) If an Affirmative or a negative conclusion is false for BD, then the conclusion will not follow the given statement. 3) If a negative conclusion is true for BD, it may or may not be true for ADs. 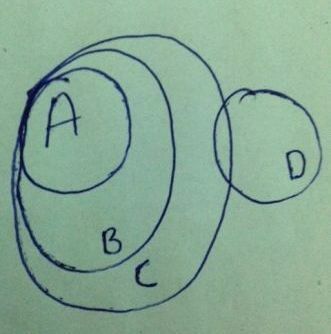 Draw the Venn diagram for the given statements with minimum overlapping. 1) Conclusion I is positive & true for BD.Hence, conclusion (I) follows the given statements. 2) Conclusion II is affirmative & is false for BD. So it does not follow the given statement. 3) Conclusion III is negative & is true for BD. This means we will have to draw some ADs to verify its truthfulness. 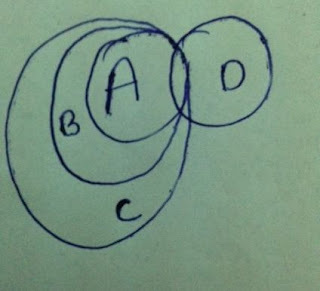 While writing AD, for a negative conclusion use the complementary pair. In conclusion (iii), ‘No’ is given. For ‘NO’, the complementary pair is ‘SOME’. Then start from ‘Some A is D’ & then continue with the given statements. By seeing AD we can say that the statement is true. But to a conclusion to follow the statement, if both BD & AD is true for a conclusion then it will not follow the statement. If true for BD & false for AD, then conclusion follows the statement. In this case answer is “Doesn’t follow”. 4) Conclusion IV is negative & is false in BD. If a conclusion becomes false in BD, then it is not necessary to move further for AD. Answer is “Doesn’t follow”. So final solution is only conclusion I follow. 1) We need to draw AD only when a negative conclusion becomes true for BD. 2) In AD, if the complimentary conclusion turns to be true, then the conclusion under consideration is false. (As in conclusion III). 3) In AD, if the complimentary conclusion turns to be false, then the given conclusion follows the given statement. Please know the basics & Practice well with the above-explained method. This will surely help you to score Cent percent in exams on this topic.